But isn’t Sherlock Holmes most associated with the classic Basil Hathbone ensemble of a deerstalker cap and Ulster cape? 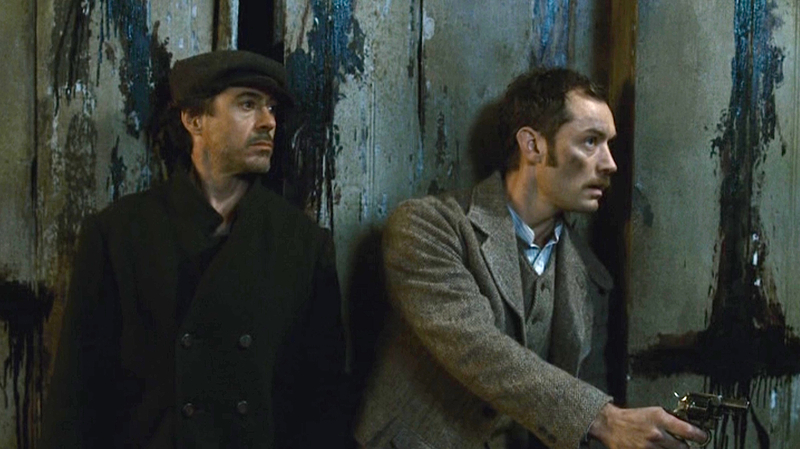 Not so in the 2009 film starring Robert Downey Jr. as the iconic detective, as director Guy Ritchie insisted that his incarnation would neither wear the deerstalker nor say “Elementary, my dear Watson,” choosing instead to present what Roger Ebert would call a “cheerfully revisionist” take on Arthur Conan Doyle’s character. 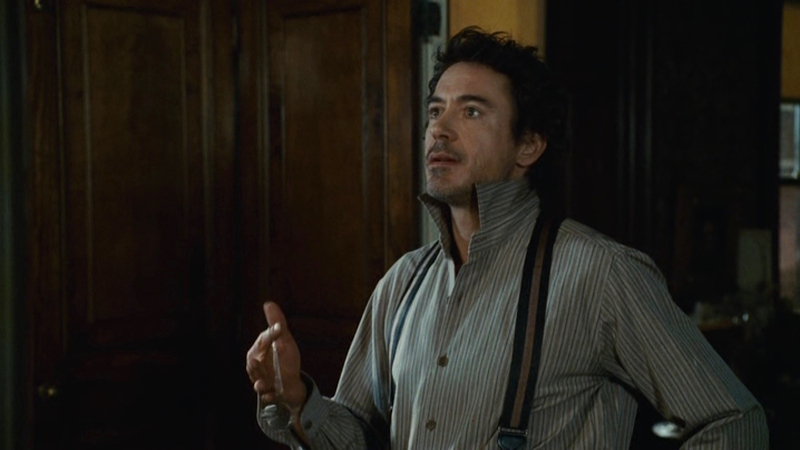 Robert Downey Jr.’s attire as Sherlock Holmes – typically consisting of frock coats in black cord or plum wool, fancy brocade waistcoats, and striped cravats – doesn’t much lend itself to anything realistically wearable or practical 130 years after the first written adventure, A Study in Scarlet, was published. For this covert nighttime adventure at the London docks, however, Holmes tones down his sartorial approach by donning the unobstrusive and appropriately seafaring disguise of a wool peacoat and cap. The peacoat’s long maritime heritage dates back to the 1700s, and the heavy jacket’s ability to survive in more or less an unadulterated form for three centuries speaks volumes about its potency as outerwear. Holmes’ pea coat is black wool that looks a bit lighter than the 30 oz. heavy Melton wool cloth often used in early naval pea jackets. The set-in sleeves are roped at each shoulder, and there is a straight flapped set-in pocket on each hip. The six buttons on the front are brown horn sew-through buttons rather than the classic naval-motif plastic or gilt buttons, and they are arranged in the traditional rectangular formation with three rows of two buttons each. Holmes wears a taupe striped pullover shirt with a point collar worn “popped” perhaps to downplay the shirt’s stylistic similarities to a modern-day off-the-rack button-up shirt. The shirt has four large brown plastic sew-through buttons on the plain front, extending down to his abdomen where a small horizontal strip runs perpendicular to the shirt’s French placket. Each sleeve closes with a single button on the cuff, though Holmes wears his cuffs unbuttoned to inject a little more chaos into his aesthetic. Holmes’ taupe shirt with its black hairline stripes and wider muted brown stripes echoes the suspenders (braces) worn over it. The suspenders are widely striped in black, brown, and black with black leather double-hooks that fasten to buttons along the inside of the trouser waistband in the front and back. Holmes wears a pair of golden brown pinwale corduroy flat front trousers, clearly a few sizes too large but held up by his aforementioned suspenders. The waistband is split with a back notch to accommodate the rear loops of his suspenders. The darted back also has a cinch adjuster strap and no pockets. The slightly flared trouser bottoms are plain-hemmed. 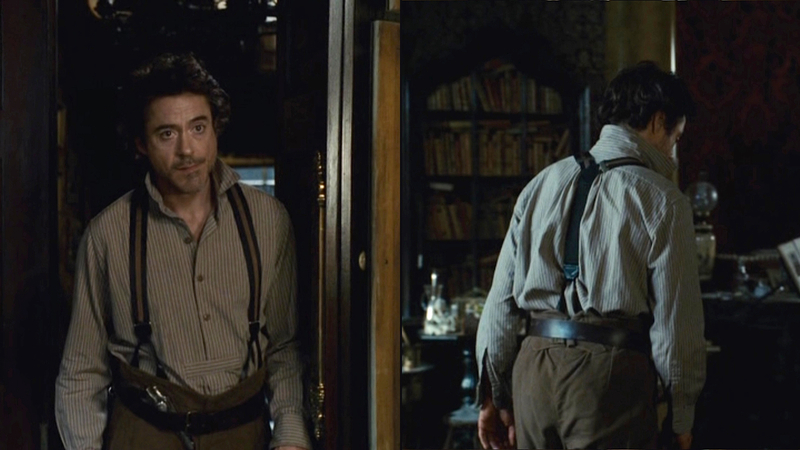 Holmes also wears a wide dark brown leather belt around the outside of his trousers, as they have no belt loops, which seems to mostly serve the purpose of keeping his revolver in the place. The belt hooks in the front through a large brass single-prong buckle. Note the short horizontal strip across the shirt’s abdomen (at left), which cuts off the “French placket” and indicates that it is, indeed, a pullover shirt rather than a traditional button-up. 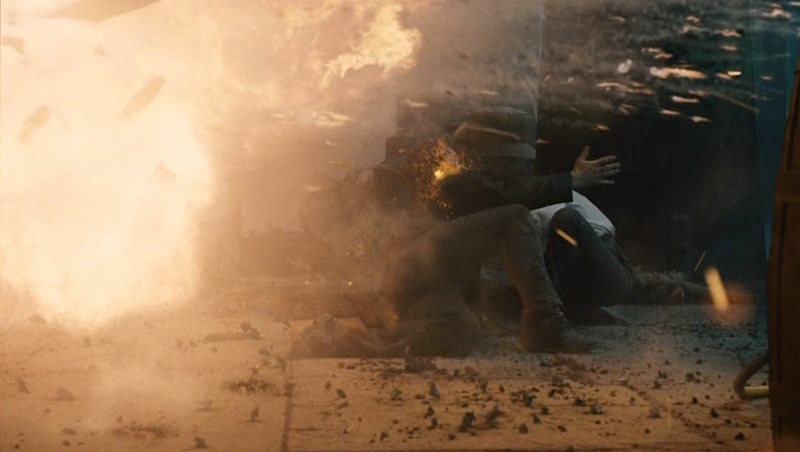 Holmes and Irene take a tumble. 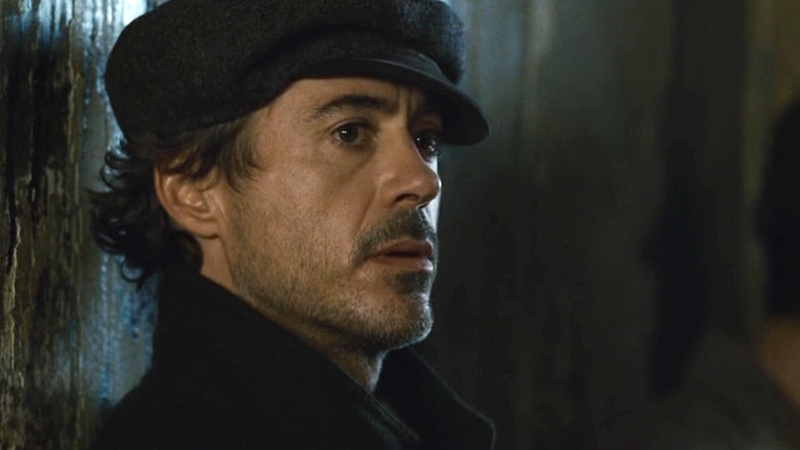 To top off his maritime-inspired ensemble, Holmes wears a plain dark charcoal wool peaked “skipper cap” with a stiff black visor. This type of headgear is also known as a “fiddler cap” for Topol-related reasons. Sherlock Holmes’ simple dark pea jacket, taupe striped shirt, corduroy trousers, and boots is a fine example of how old-fashioned workwear can be revived and modernized for a stylish fall look. Another Edwardian era BAMF Style favorite, Sidney Reilly (Sam Neill), can be seen wearing a classic peacoat in the third episode of Reilly: Ace of Spies when in disguise as a German fireman. 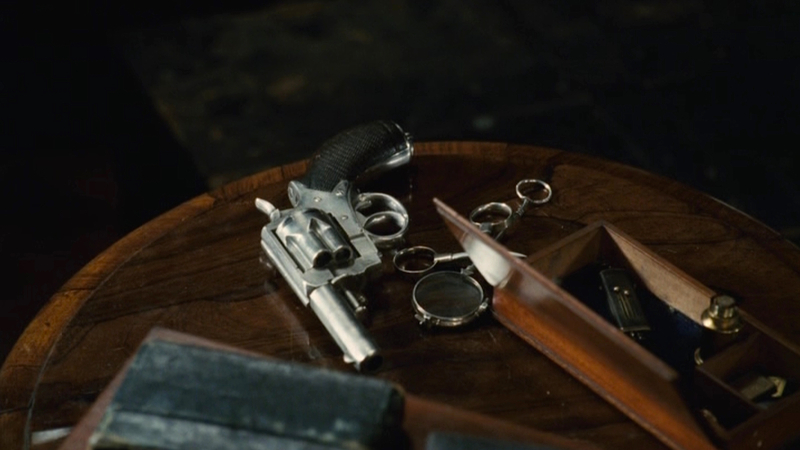 Sherlock Holmes employs his own revolver as a plot device, conspicuously leaving it behind so that Dr. Watson – who has “retired” from joining Holmes on his adventures – is forced to bring it to him. 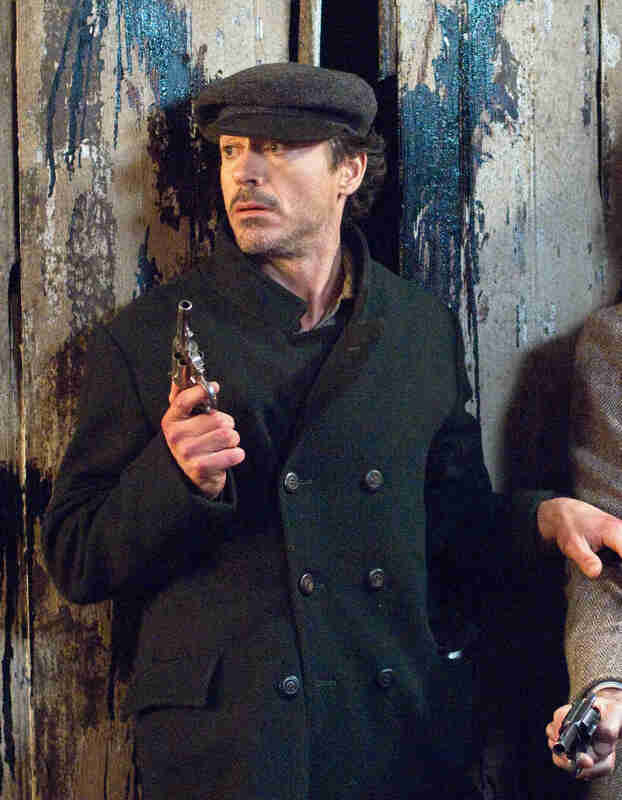 Holmes conspicuously leaves his Webley for Watson to discover. British arms manufacturer Webley & Scott introduced its first double-action revolver in the 1867; following its adoption the next year by the Royal Irish Constabulary, it became colloquially known as the Webley “RIC” model. The legendarily eccentric American general George Armstrong Custer was known to have owned at least one pair of Webley RIC revolvers, and it is rumored – though not conclusively proven – that these were his weapons of choice during his infamous “last stand” with the 7th Cavalry during the Battle of Little Bighorn in 1876. The Webley No. 5 Army Revolver was introduced the following decade and chambered for a variety of ammunition ranging from the large .44-40 Winchester, .455 Webley, and .476 Eley cartridges to smaller .360 and .38 calibers. Though never adopted by the British Army, it did find use among the Transvaal army in South Africa. 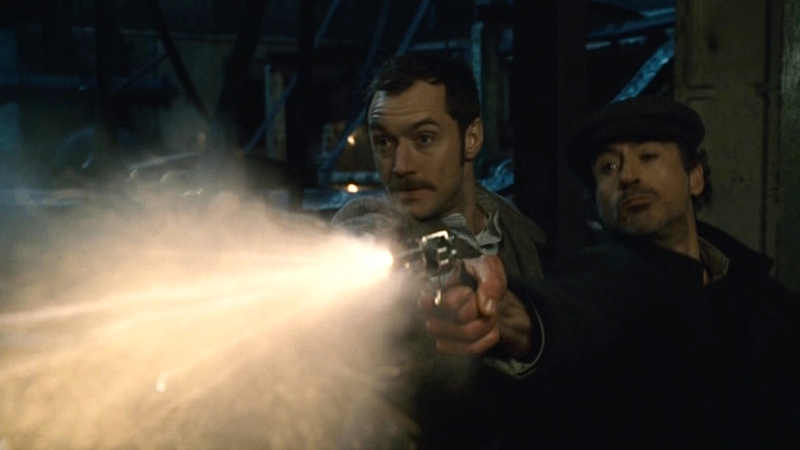 Holmes shows a rather cavalier attitude toward his firearm, carrying it loosely in his belt and disregarding his own advice to “save the bullets” after he and Watson are startled at the docks. Dr. Watson also carries a Webley revolver, a smaller-framed “British Bulldog” that was commonly manufactured and copied during the era. A British Bulldog was notably the deranged Charles J. Guiteau’s weapon of choice when he assassinated U.S. President James A. Garfield in 1881. Three decades? Or centuries? (you can delete, simple note). Indeed! Good catch – thank you.